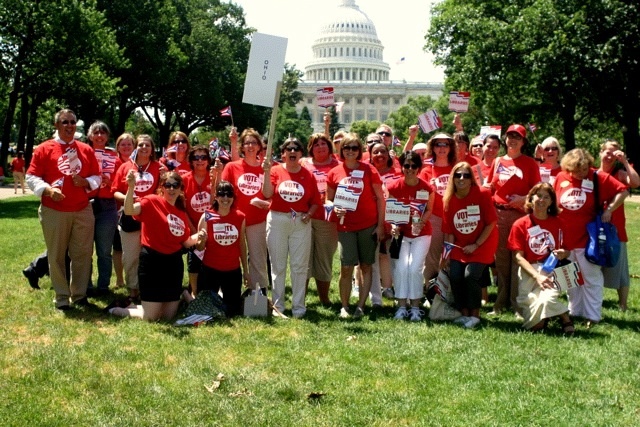 The heat, humidity and relentless sunshine did not deter some 2,000 librarians from a rally for American libraries on Tuesday, June 29, at the tail end of the ALA Annual Conference in Washington, D.C. I was grateful to be part of the group as one of ALAO’s legislative advocates, and thank ALAO for supporting me with a Legislative Advocate Travel Award. 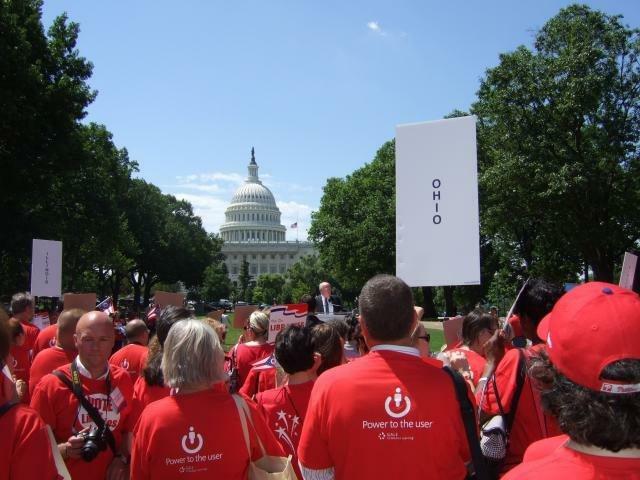 The Ohio contingent included nearly 30 people, representing school, public, and academic libraries, plus INFOhio and the State Library. Prior to the conference, William Morris of the State Library did a superb job of keeping us informed and arranging appointments with members of congress and/or their staff. Between the legislative alerts from the ALA Washington Office and materials prepared specifically for Ohio, we were armed with excellent background information and talking points on funding the Library Services Technology Act (LSTA) and Improving Literacy Through School Libraries; a mandate to include school libraries, staffed with a full-time state-certified school librarian, in the Elementary and Secondary Education Act (ESEA); and requests to support Net Neutrality, the Access to 21st Century Communications and Video Accessibility Act, and Federal Research Public Access Act (FRPAA, H.R. 5037). 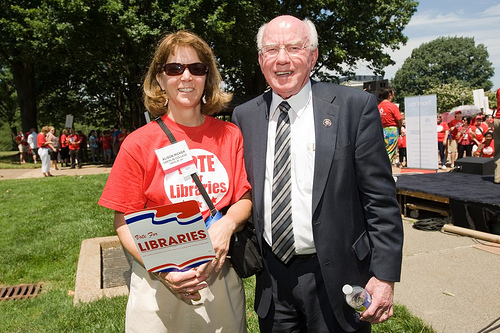 We also sought support for the Congressional Research Service Electronic Accessibility Act of 2009 (H.R. 3762), Open the Congressional Research Service (S.R. 118), and to oppose the Fair Copyright in Research Works Act (H.R. 801), which would negate and reverse the NIH Public Access Policy and block FRPAA. You can readily find information on all of this at www.ala.org/ogr. The entire group met with Senator Brown’s Legislative Assistant for Education issues, Moira Lenehan-Razzuri, shortly after the rally, where we emphasized the effectiveness and efficiency of LSTA-funded collaboration within Ohio and the essential role of libraries for education, training, and economic development in the state. Individual appointments with our representatives were next, followed by a smaller group meeting with Dana Smullen, Professional Staff Member for Senator Voinovich. Ray English and I met with Deborah Koolbeck, Legislative Director for the Hon. Marcy Kaptur (9th District, which includes Oberlin), and with the Hon. Jim Jordan (4th District) and his Legislative Director George Poulios. Jordan and Poulios were very generous with their time, as was Debra Logan, school librarian in Mount Gilead, who graciously allowed us to tag along to her appointment. FRPAA was referred to the House Committee on Oversight and Government Reform, of which Kaptur and Jordan are both members. Other Ohio members of that committee include Steve Driehaus, Dennis Kucinich, and Michael Turner – if you are a constituent of any of these Representatives, I urge you to write to him/her and ask for an open hearing on the FRPAA bill. I greatly enjoyed the day’s experience, and had fun as an Advocacy volunteer during the conference – handing out flyers at the Exhibits Opening and directing foot traffic on the morning of the rally gave me some insight into the coordination required for an event of this size. I recommend it to anyone with an interest in how our country is governed – and isn’t that all of us?